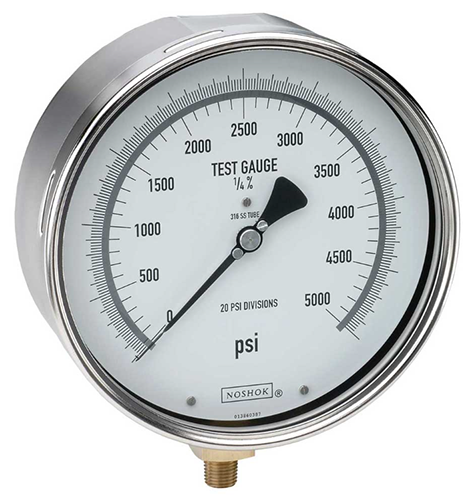 Noshok® type 800 precision test pressure gauges are highly accurate dry gauges. Typical applications include aerospace equipment, gauge repair facilities, laboratory & test equipment, and precision measurement. Noshok® series 12 sanitary diaphragm seals feature a flush mount diaphragm and all welded construction, ideal for food & beverage, pharmaceutical and sanitary markets. They are commonly used for water & wastewater, oil & gas, petrochemical, chemical processing, industrial automation, food & beverage, marine, agriculture, steel fabrication, mud pumping, pharmaceutical, pulp & paper, and pneumatic applications. Noshok® 200 series low pressure gauges are sensitive capsule-type, non-fillable dry gauges. They are commonly used for filter monitoring, gas distribution, HVAC, leak detection, level indication, and medical applications. Ashcroft® type 2084, 2086, & 2089 digital test gauges are highly accurate test instruments providing exceptional features and performance. The full scale total error (TEB) includes the effects of linearity, hysteresis, repeatability, and temperature from 0° to 150°F. Silicone MEMS sensor technology provides accuracy and long term stability demanded by test instrumentation users. This is an ideal product for test and measurement applications. Noshok® Series 400 (dry) & 500 (liquid) Stainless Steel pressure gauges are high quality gauges used for chemical processing, oil field and offshore applications, paper mills, agriculture plants, marine, water and wasterwater applications.